When it comes to powering our homes and our city, we do have green energy options. 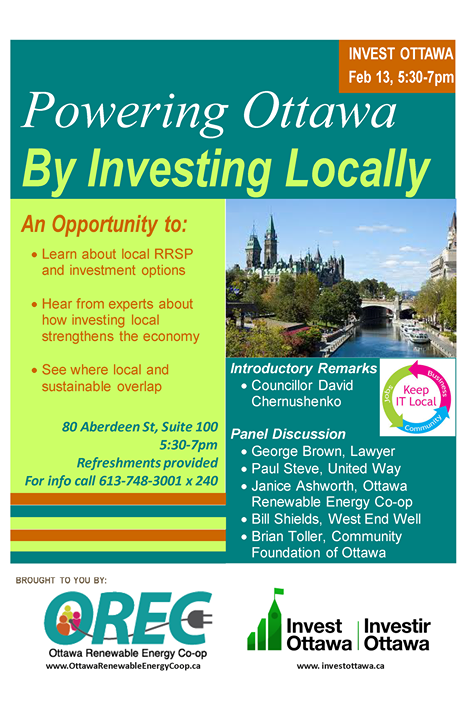 The Ottawa Renewable Energy Co-op and Invest Ottawa are hosting a session on “Powering Ottawa by Investing Locally” for people to learn about how they can support and invest in local renewable energy, local food and other sustainability initiatives. Speakers are lawyer George Brown, the United Way’s Jen Benedict, Janice Ashworth of OREC and Bill Shields of the West End Well, with an introduction by city councillor David Chernushenko. It’s at Invest Ottawa, 80 Aberdeen St., Suite 100 on Thursday, Feb. 13, 2014 from 5:30-7 p.m.
You can find out more about OREC here, and read about some of the benefits of individuals getting involved in producing electricity here.